In parallel with the introduction of new, potent monotherapies for choroidal neovascularization (CNV), we are facing a clear trend toward individualized or personalized medicine. In the case of CNV, this may be combination therapy. The increasing number of patients suffering from age-related macular degeneration (AMD) highlights the need for a reduction in treatment frequency without compromising efficacy. All relevant available monotherapies for CNV have drawbacks. The efficacy benefit of those approaches is either limited or the treatment regimen with efficacy proven in clinical trials involves monthly intravitreal injections. Combination therapy to treat AMD-related CNV is derived from the combination therapy concept in oncology. In both therapeutic areas, the goal of combination therapy is to disrupt the multiple stimuli that lead to pathologic cellular proliferation. In cancer, tumors and the neovasculature that feeds the tumors are targets, while in ocular CNV, the neovasculature itself is the target. The rationale for combination therapy in AMD has been described in detail.1-4 Several known factors (and certainly many as yet unknown ones) contribute to pathologic CNV. The cascade of subretinal changes that leads to neovascularization appears to occur as follows: inefficient metabolic activity (i.e. nutrients blocked from receptors and cellular waste clogging the tissue) leads to hypoxia; hypoxia leads to choroidal vascular atrophy; choroidal vascular atrophy leads to inflammation; inflammation leads to angiogenesis; and angiogenesis, mediated by vascular endothelial growth factor (VEGF), leads to neovascularization. Neovascularization may represent an attempt by the choroid to optimize its metabolic activity and preserve its essential function. This degenerative cascade is nuanced and has been described, although new findings that refine the cascade continue to be reported. Most notably, the role of inflammation and genetic predisposition to inflammation is being elucidated. Complement factor H polymorphism appears to be associated with AMD pathogenesis. The three main therapeutic targets of CNV development and proliferation, derived from the cascade described above, are neovascularization itself, angiogenesis, and inflammation. A therapy is available for each of these targets: photodynamic therapy (PDT) using verteporfin eradicates established CNV, anti-VEGF therapies block angiogenesis, and anti-inflammatory drugs suppress inflammation. Targeting the pathogenesis of CNV in different ways, using these therapies in combination, may address the problems of each as monotherapy, and more importantly, lead to eradication of CNV and to good vision outcomes with just one treatment course. A prospective case series evaluated 104 patients with CNV due to AMD who were treated with a combination of PDT plus intravitreal bevacizumab (1.5 mg) plus intravitreal dexamethasone (0.8 mg).3 Reduced fluence PDT (42 J/cm2 given at the standard fluence rate of 600 mW/cm2 for a reduced time of 70 seconds) was administered 16 hours before bevacizumab and dexamethasone injections. Patients attended follow-up visits every 6 weeks. After an average follow-up of 70 weeks, the mean increase in visual acuity was 1.78 lines (8.9 letters) [P<0.01] and 39% of patients had a visual acuity improvement of at least 3 lines. Mean decrease in central retinal thickness was 171 μm [P<0.01]. No serious adverse events were observed. Results from several other studies evaluating combination therapy for CNV associated with AMD have been presented at scientific meetings and/or will be published soon. These preliminary results have revealed favorable visual acuity outcomes and/or lower retreatment rates, good safety profiles, and favorable morphological effects for double therapies6-9 and triple therapies10,11 with anti-VEGF, PDT, and (for triple therapy) steroid combinations. Even lesions which have not been studied in the large clinical trials, such as retinal angiomatous proliferation (RAP), can be treated effectively with triple therapy (Figure 1). Figure 1. 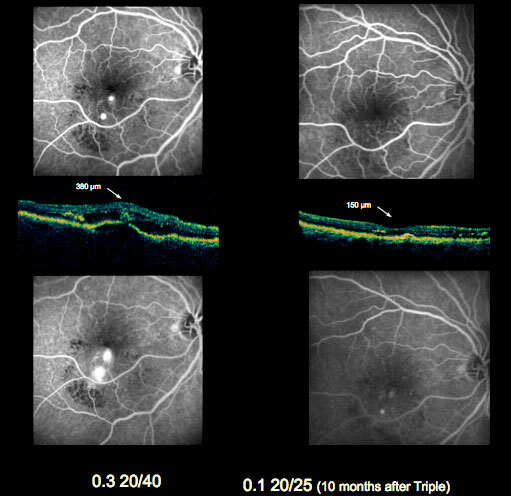 Early and late phase fluorescein angiography and OCT from a patient suffering from RAP lesions (left: before treatment, VA: 20/40); right: 10 months after treatment, VA: 20/25). After one triple approach treatment session, the lesions were dry and visual acuity improved; OCT showed marked reduction in the intraretinal, subretinal, and sub-RPE fluid. To date, no retreatment has been required.